With a robust, soundproof enclosure, the PANTHER 41.25 kVA diesel genset is available in single-phase and three-phase versions. Combined with a lighting tower, it can provide light for night construction work, or can be fitted with a socket board to power a wide variety of tools. Available in single-phase and three-phase versions and fitted with electronic control. For enhanced mobility, discover the trailer-mounted genset. 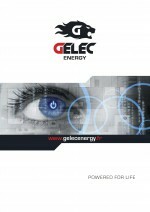 Bi-Oil option : Genset operating using vegetable or recycled oil instead of diesel.